If you're looking for a small, attractive, friendly bunny, the Dutch rabbit fills the bill. Even if you're not familiar with the name, you've probably seen Dutch rabbits. 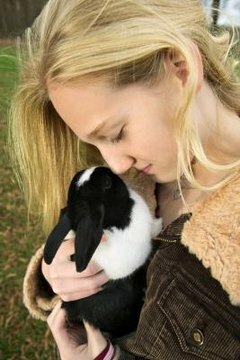 These black-and-white bunnies aren't just beautiful; they have a good disposition and they're relatively easy to handle. No surprise -- Dutch rabbits originate from the Netherlands. Their black-and-white coloration comes from an ancestor known as the Petite Brabicon. By the time that breed appeared in mid-19th century Great Britain, it was known as the Hollander. One of the oldest pedigreed rabbit breeds, it remains one of the top show breeds for bunny fanciers. Since the Dutch is among the friendliest rabbits, the breed is a good choice for novice owners and for young, supervised children. This gentle bunny doesn't mind careful handling and petting, unlike some flightier breeds. However, for any rabbit, keep picking up to a minimum. Serious injury can result if a bunny is dropped or jumps out of a person's grasp. Although the Dutch is a small rabbit, it's not a dwarf breed. At maturity, Dutch bunnies weigh between 3.5 and 5.5 pounds, according to the American Dutch Rabbit Club. That means by the age of 6 months, you'll know how big your bunny will grow. Besides the basic black-and-white bunny with brown eyes, you can find Dutch rabbits in other colors with white, and with various eye colors. Variations include the blue, a slate gray hue with gray eyes; the chocolate, a rich brown color with brown eyes; the gray, a roan shade of a black base coat with white hairs and dark brown eyes; the steel, a black-bodied, brown-eyed rabbit with uniform cream colors on hair tips; and the tortoise, a brown-eyed bunny with an orangey solid coat and darker facial coloring. If you're interested in showing your Dutch rabbit, your pet must meet the breed's body standard qualifications. Besides coloring, these include relatively short ears and an overall compact, round shape. The facial blaze must continue to a point between the eyes. The bunny's cheeks should be white, but the area where the whiskers emerge must be black. White markings on the feet must be clearly delineated from the solid color, not a color blend. The saddle, the section between the bunny's colored and white fur on the back, must continue around the animal's body in a straight line.